Last weekend turned to be one of the memorable weekends I ever had. A bunch of funky looking IT geeks joined together to make the team closer, the outing made it as success. Living in the thick forest of computers and sound of binary algorithm is our lifestyle; we often talk to a lady of assumption, robot chat with no flush but lights and colors a complete virtual flora and fauna. This time for a change we had to pierce off our work area to look outside the window for a blooming flowers, corkscrew roads, tree covered hills often mistaken for green carpet, freshly brewed air with no emission and the real mountain dew mineral water are few reason for us to feel lost in the heaven. When we reached the Princess of Hill stations “Kodaikanal”(in Tamil language KOdai means Summer, Kanal means ‘to see’, hence a place to see in summer or a place to visit in summer), she welcome us with the warmth comfort. After firm landing our foot in the kodai hills, we had a short break at the cottage, just to regain the energy lost during the past 12 hours of bus travel. It was great indeed to be part of the tour; all I had in my mind during the trip is a kind of rhythm reminding me of missing nature linked lifestyle in the urban life. The Geeks crawled down to the park outside the accommodation to play off the stress inside the soul. We played some games like Volley ball, War of hand towel, Antakshari, Dance, Singing and Individual talent tamasha in the grounds of Chettiar Park, it was filling and we were laughed it off, Noon time we applied brake to the non-stop fun and poured some fuel to our hungry stomach. Sub twenty temperatures in the middle of hot summer is something we chennaities never experienced but last weekend it was un-usual for many of us. Kodaikanal grabbed all the awards for making us feel hiding inside the blanket in the hot summer. Camp-fire in the dusk with performance of playmate was great, a few bottles of beer and liquor propelled us even more and the stage was flying out in the air. Horse riding, boating, shopping and sight seeing what else one can afford to not miss in a single day, we enjoyed them all. The height of the fun to me came when I got a chance to travel in a Jeep in Kodaikanal to visit handmade chocolate bazaar. A short ride with jam packed jeep on the coiled mountain road is a fun for sure trip, we enjoyed it. The chocolates and spices of mountain are mouth watering and delicious is not enough to describe the yummy taste. I was introduced to the Olympic fame Shooting sports by a friend of mine, in fact I got hooked to the sports after holding the gun he had for a second. Thats where I decided to lay my hands on a air rifle. 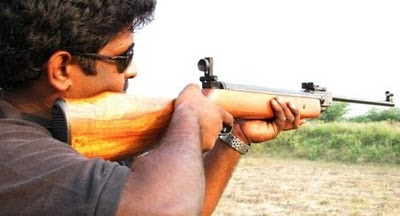 After couple of search on the internet I found Indian Hume Pipes is a company that produces quality air rifles in India. The internet is a window to the world, I found all the details to buy the IHP rifle. 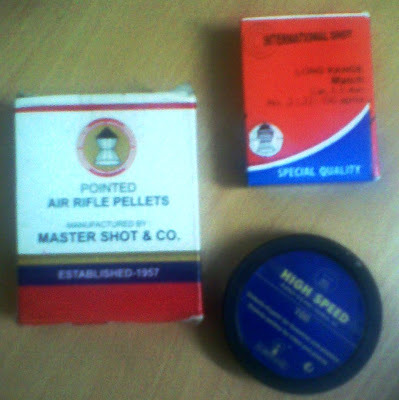 Sadly I also realized the Chennai based Armory are always on the higher side for the rifles / any weapon. With great regret I spend extra two thousands a premium buying an Air Rifle for my practices. I didn't stop my hunger to practice hence I started doing my own target stand to fix the paper target models downloaded from Internet (thanks to google, indiansforgun.com and thegungeek.com). My Do it Yourself preparation of target stand is still half way but I'm very positive and will complete the setup in a day or two. After landing in the following page, I decided to make myself one target stand. As a first step I bought a 3 meter length FinOlex 50mm (outer dia) 1 1/2" (inner dia)PVC pipe with 4mm thick wall pipe and brought it home. 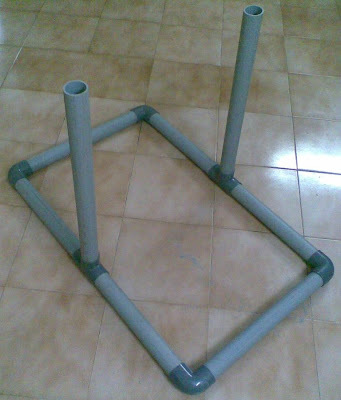 I wish to slightly modify the top model to make it even more sturdy and easy usable with available materials. Will post picture after I get the top portion completed. 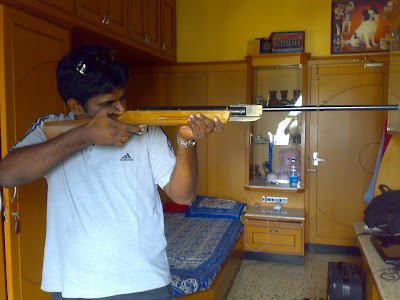 Meanwhile I also gathered few guys to accompany my practice time, hence asked a friend of mine to buy a air gun too. Hurray now we have two and few more from other part of the state. 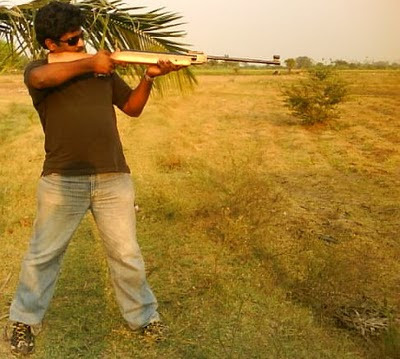 Yesterday we visited a friend's farm in Kancheepuram to try out few tricks that we learned from Internet and yes it was a first successful trip for me in terms of the new sports shooting arena. We had lots of time in firing plenty of pellets, learned lots of things and of course the team is growing.